Florida Highway Patrol Trooper Chelsea Richard lost her life in the line of duty today when she was struck by a driver on I-75 in Marion County. While investigating a crash, a second multiple vehicle crash occurred and a pickup truck swerved into the trooper, a tow truck driver, and a bystander. Trooper Richard and the tow truck driver were killed at the scene. The third injured person was transported to the hospital in critical condition, where he later died. 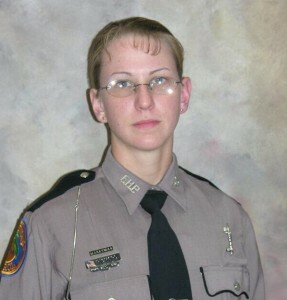 Trooper Richard, 30, was a nine year FHP veteran. She is survived by her four year old son. The crash is under investigation. Services for the fallen trooper will be announced by the FHP. It has been a hard week for law enforcement with Trooper Richard’s death, two Alaska State Troopers gunned down, and an LAPD officer killed. Please be safe out there. This entry was posted in Officer Down. Bookmark the permalink.